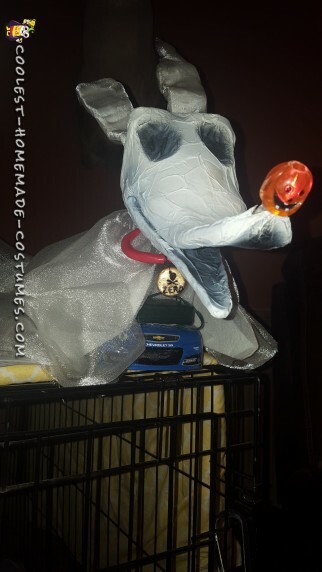 Coolest DIY Young Maleficent Costume – Make Heads Turn! When I was a young kid my mother would put on Tim Burton’s The Nightmare Before Christmas for me to watch everyday, it was and still is my favorite movie. 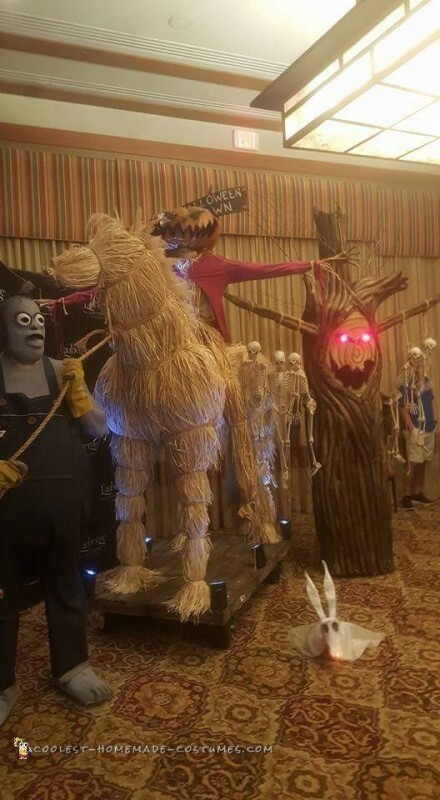 One scene that always excited me was at the beginning when the “Pumpkin King” is pulled into Halloween Town on a giant straw horse by a giant man with a axe in his head and lights himself on fire to emerge as the Jack we all know and love! 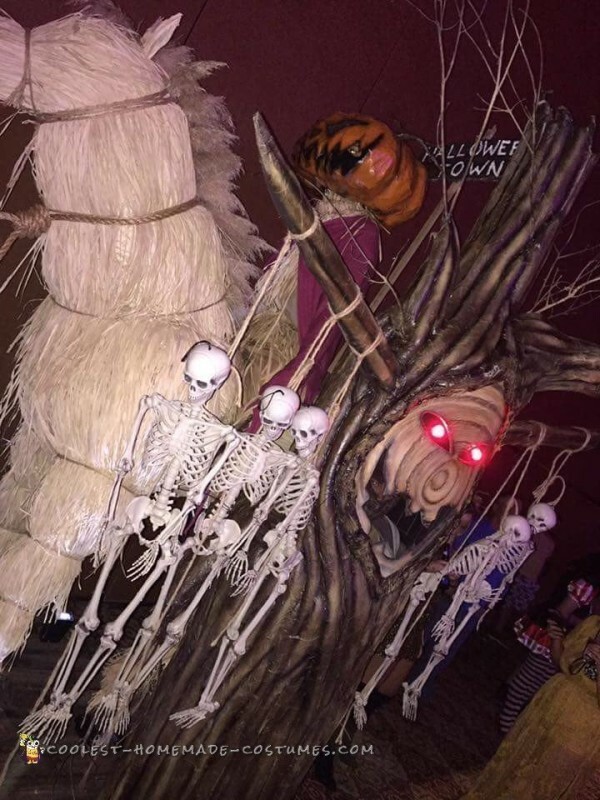 I also was intrigued by the giant walking tree and his singing skeletons that also make an appearance in the opening scene. Being that I couldn’t stop there, I also wanted to bring to the life the cutest ghost dog ever! Zero! 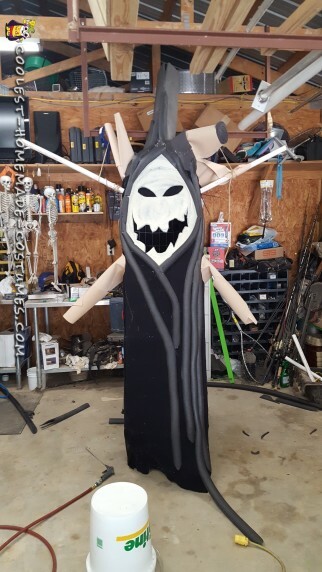 So, that was our inspiration for our The Nightmare Before Christmas group costume. We were overwhelmed with the reactions we received this year at the places we visited. We posed for more pictures than we could count and were asked many questions about how the items were made. Many people were not aware that there is actually 3 people in our Nightmare Before Christmas group costume! 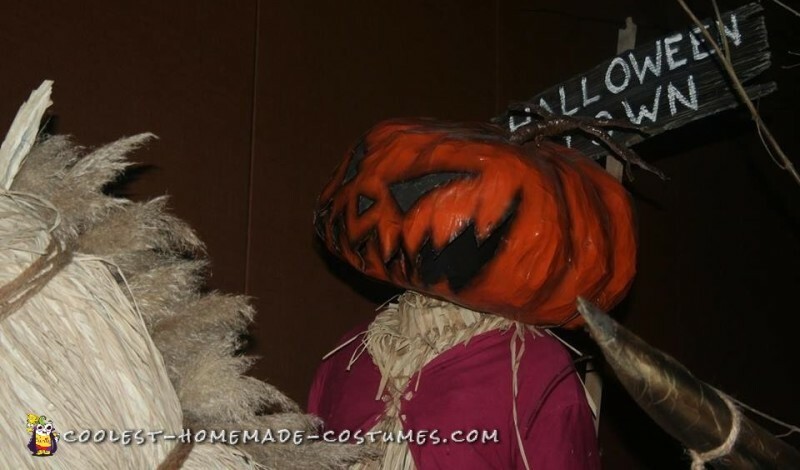 Most thought that the Pumpkin King was actually a fake scarecrow! So that gave opportunities to spook a few people when he would start moving! Zero was also a big hit as he scooted across the floor with that adorable smile! Everyone loved him and we were the hit of the night! When creating our Nightmare Before Christmas group costume we ran into a few problems….First thing was this was not our original idea for Halloween! We had almost finished a screen accurate version of the whole Suicide Squad 5 weeks before Halloween and then were told that prop weapons would not be allowed this year. So I came up with this idea and only had 5 weeks to bring it to life. Although not an easy task it was a fun one! Second problem we had to make everything removable to make sure we could get in and out of door ways. The whole horses neck and head is removable and the tree was easy to slip in and out of so we could get it inside place. Even with all the modifications made to our costumes we were actually turned away at a contest because our costumes were to large! The horse stood at 8 ft tall and the tree stood at 9 ft. So even with a few set backs I am very proud at what we were able to produce this year!!!!!! So I started with the horse, he is made out of aluminum pipe and a barrel in the midsection. 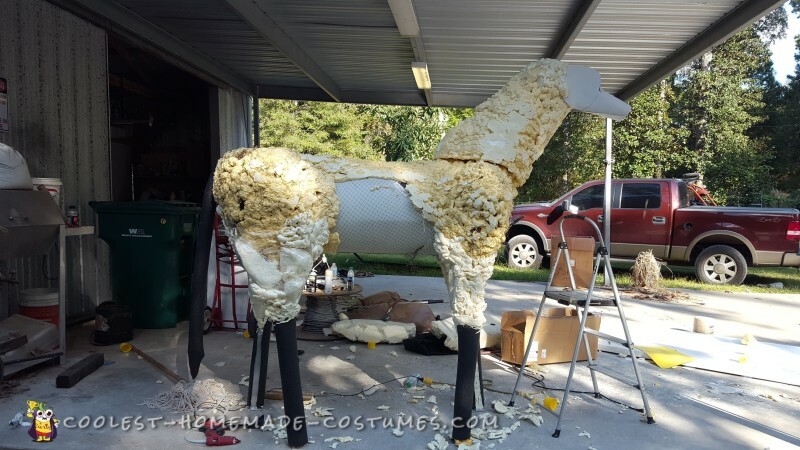 I then layered hay and expanding foam to shape the horse and bring it to life. 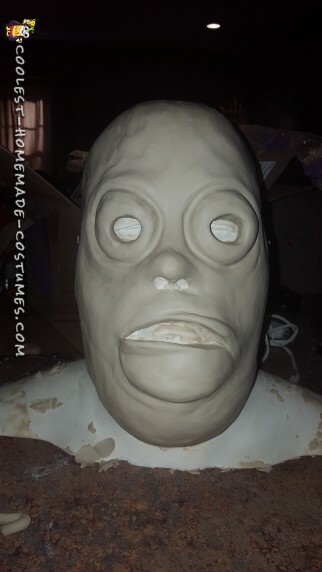 We made the head removable so it would be easier to get in and out of door ways. 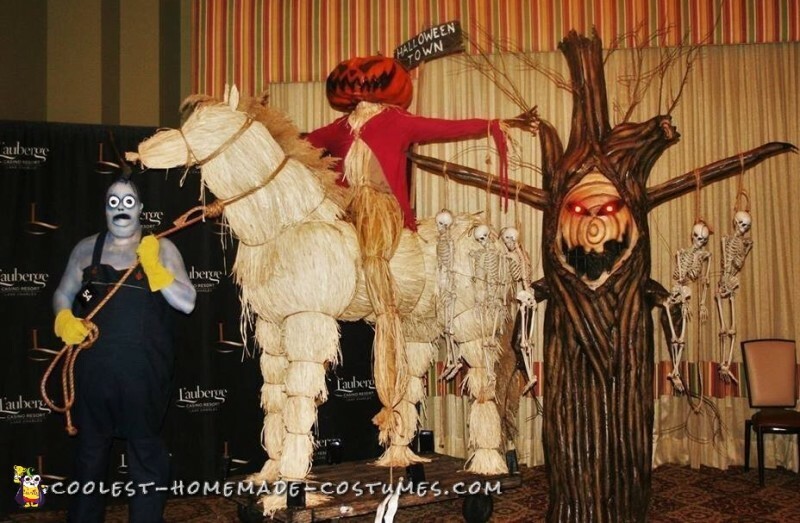 Once his shape was sculpted I covered the whole horse in raffia table skirts with hot glue and used twine to gather it up and give it a authentic look. His tail was a piece or pipe insulation and was cover in pompus grass flowers. His platform he sat on was aluminum framing and a piece of plywood. I then took craft foam and cut it into strips and glued it on the platform then dremeled it to give it an authentic wooden plank look. We added swivel wheels we purchased at a hardware store. Strobe lights and a music speaker were added for dramatic effect. The start of the straw horse. Horse ready for its hula skirts! For the Pumpkin King I mached a pumpkin and cut out a hole at the bottom for his head and cut out the eyes, nose, and mouth. 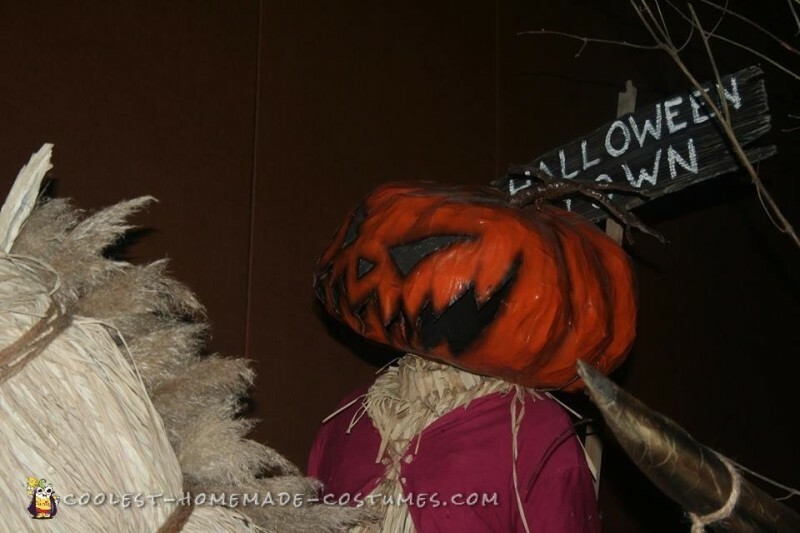 His costume was sewed by hand and I added more raffia skirting to make him look like a straw man. His hands were made from bamboo that was cut from my yard and thermoplastic beads that I shaped into hands then painted. For the tree I got the shape with wire fencing and then added fabric on top. I layered pipe insulation over the whole tree to give it its tree like texture. It was then covered in tissue paper and painted (as paint doesn’t stick to pipe insulation). I then added some fresh cut branches to the top to give it a more real feel. The tree in its early stages. Behemoth the Big Blue Man! For my giant axe man Bohemeth I started by sewing a rather large set of overalls. I then sculpted, molded and painted a prosthetic to resemble the character from the movie. 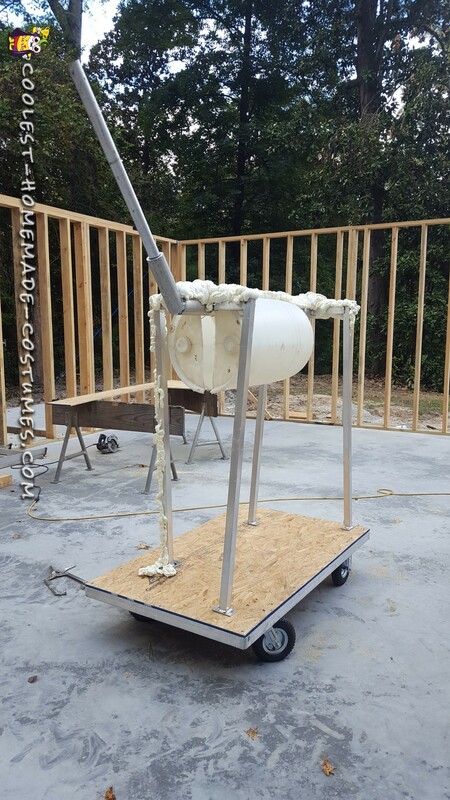 The axe was then 3D printed to keep the weight down and applied to the prosthetic. And last but certainly not least, for Zero I purchased a RC car and started on the head. I used floral foam and craft foam to shape his head. Then I draped some shimmery material over his back that gave him a ghostly look. I then added his collar which was made from thermo plastic and painted. I added lights to his back to give him a glow and a glowing pumpkin nose! 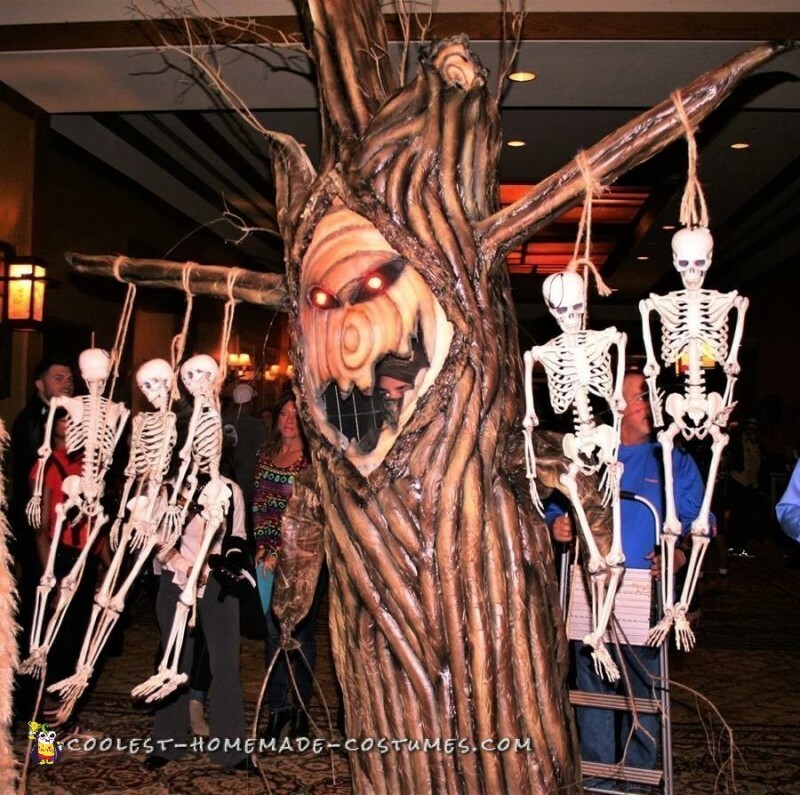 Check out this video of our epic Nightmare Before Christmas group costume in action!